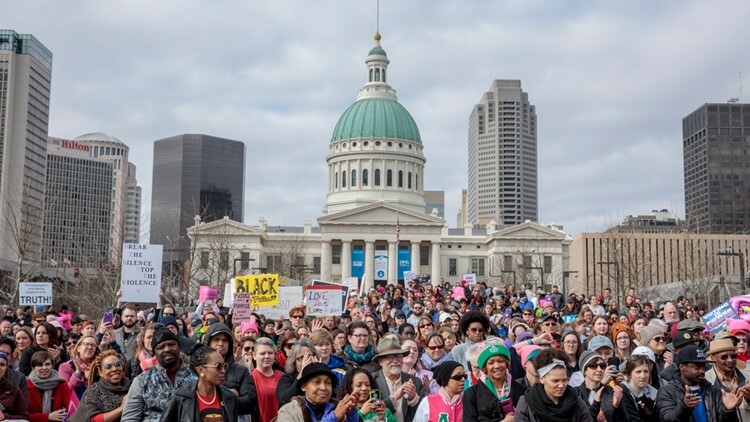 ST LOUIS, MO - JANUARY 20: Participants gather at the Jefferson National Expansion Memorial National Historic Site during the Women's March for Truth on January 20, 2018 in St Louis, Missouri, United States. One year after women and their supporters rallied in the largest single-day demonstration in American history, demonstrators gathered again to raise awareness for women's issues. The third annual march will go on as planned Saturday. ST. LOUIS — A little snow isn’t going to stop the St. Louis Women’s March this weekend downtown. The third annual march will go on as planned Saturday. Participants can start gathering at 10 a.m. in Aloe Plaza, across from Union Station. The march starts at 10:30 a.m.
“Ladies, put on your coats and lace up those boots,” the page wrote in a news release. The march will continue down Market Street to the plaza at Tucker and Market, across from St. Louis City Hall. The march will finish with community leaders sharing stories “of how they turned inspiration into action.” Participants are then encouraged to volunteer their time with local organizations. Nearly 1,000 people marked themselves as going on the St. Louis Women’s March Facebook page. Another 2,000 said they’re interested in the event. Snow is expected to start falling Saturday morning, with the heaviest stuff expected before noon. Snow will continue through the afternoon. The St. Louis metro area can expect anywhere from 2” to 4” of snow.